USES: This medication is used to treat certain anxiety and panic disorders. 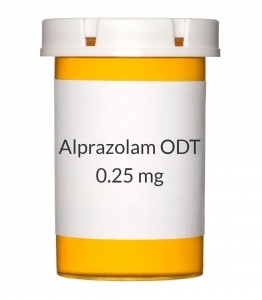 Alprazolam belongs to a class of medications called benzodiazepines. It acts on the brain and nerves to produce a calming effect and helps relieve panic and anxiety symptoms. It works by enhancing the effects of a certain natural chemical in the body (GABA). HOW TO USE: Take this medication by mouth as directed by your doctor. Dosage is based on your medical condition and response to treatment. Your dose may be gradually increased until the drug starts working well. Follow your doctor's instructions closely to reduce the risk of side effects. It is best not to take this medication with a high-fat meal because absorption may be slowed. Make sure your hands are dry before you are ready to take this medication. Place the tablet on top of your tongue immediately after removing it from the bottle. The tablet will dissolve in your mouth. Although it is not necessary to take this medication with any liquid, you may take it with water. If your dose is only half a tablet, be sure to throw away the unused portion of the tablet. Do not save it for future use because it may become inactive. This medication may cause withdrawal reactions, especially if it has been used regularly for a long time or in high doses. In such cases, withdrawal symptoms (such as seizures) may occur if you suddenly stop using this medication. To prevent withdrawal reactions, your doctor may reduce your dose gradually. Report any withdrawal reactions immediately. Along with its benefits, this medication may rarely cause abnormal drug-seeking behavior (addiction). This risk may be increased if you have abused alcohol or drugs in the past. Take this medication exactly as prescribed to lessen the risk of addiction. When this medication is used for a long time, it may not work as well. Talk with your doctor if this medication stops working well. Tell your doctor if your condition persists or worsens. DRUG INTERACTIONS: Drug interactions may change how your medications work or increase your risk for serious side effects. This document does not contain all possible drug interactions. Keep a list of all the products you use (including prescription/nonprescription drugs and herbal products) and share it with your doctor and pharmacist. Do not start, stop, or change the dosage of any medicines without your doctor's approval. Some products that may interact with this drug include: kava, sodium oxybate, drugs that affect stomach acid (such as antacids, famotidine, omeprazole). Other medications can affect the removal of alprazolam from your body, which may affect how alprazolam works. Examples include azole antifungals (such as itraconazole, ketoconazole), cimetidine, certain anti-depressants (such as fluoxetine, fluvoxamine, nefazodone), drugs to treat HIV (delavirdine, protease inhibitors such as indinavir), macrolide antibiotics (such as erythromycin), rifamycins (such as rifabutin), St. John's wort, drugs used to treat seizures (such as carbamazepine, phenytoin), among others. Tell your doctor or pharmacist if you also take drugs that cause drowsiness, such as certain antihistamines (such as diphenhydramine), medicine for sleep or anxiety (such as diazepam, zolpidem), muscle relaxants, narcotic pain relievers (such as codeine), psychiatric medicines (such as chlorpromazine, risperidone, amitriptyline, trazodone). Check the labels on all your medicines (such as cough-and-cold products) because they may contain ingredients which cause drowsiness. Ask your pharmacist about the safe use of those products. Cigarette smoking decreases blood levels of this medication. Tell your doctor if you smoke or if you have recently stopped smoking. STORAGE: Store in a tightly sealed container provided by your pharmacist, at room temperature, away from light and moisture. Do not store in the bathroom. Keep all medications away from children and pets. After opening the bottle, throw away any cotton that you find inside. Reseal the bottle tightly to prevent moisture from getting into the bottle. If the tablets are exposed to moisture, they may not work properly. Do not flush medications down the toilet or pour them into a drain unless instructed to do so. Properly discard this product when it is expired or no longer needed. Consult your pharmacist or local waste disposal company.